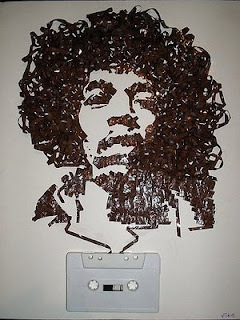 This image, a portrait of Jimi Hendrix in audio tape, is from the Flickr stream of iri5, and as amazing as it (and the rest of iri5's catalogue) is...it's just the tip of the iceberg. I've found a blog of images you can absolutely get lost in: Inspire me, now! by Szymon Błaszczyk. I should warn you: browsing through his blog is a little bit like opening a giant bag of potato chips. It takes some degree of self-control to just have one or two. It's really an amazing (and very amusing) collection of notes on design and form by a guy who bills himself as an "information architect." I got up to page 37, and I've got to stop and get something useful done! I think for many artists (certainly painters and photographers, but also theater and film artists) this sort of smartly curated collection is invaluable. The director/comic/neurologist/aesthetician Jonathan Miller (how's that for a resume?) once wrote about his collection of art books and postcards. He inspired me to start collecting and organizing my own "Necessary Images." You've got to have those referants to make the next leap in your own work, whether it's on screen or stage or wherever. Szymon's collection is full of leaps...and it's a lot of fun besides!